This is the most improved AR15 rear sight for use with todays holographic and red dot sighting systems. 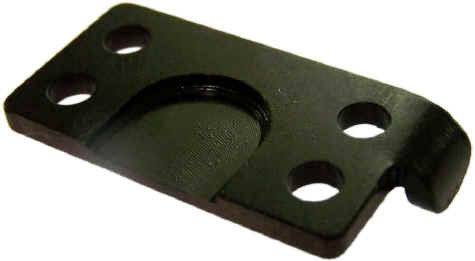 Tactical training professionals developed this notch/peep rear sight to avoid the top of the peep from covering-up the commonly used red dot type optics during co-witness sighting with the AR-15 rifle. Most peep sights get lost in the optics body. 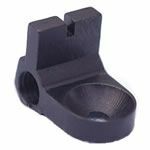 This quality CNC machined 6061-aluminum replacement notch/peep type sight allows the shooter to see the entire sight picture needed to co-witness on a target. Can be used with your favorite tritium or fiber optic front sight, including the .100. Replaces the standard flip A2 or A1 adjustable sight with no modifications. Also fulfills the shooters needs that would rather use a notch type of rear sight on their AR-15 with no optics at all. This more open sighting system allows the shooter to see all of the sights needed during low light conditions and all CQB work. There is still a medium sized opening on the peep side. The peephole on our rear sight falls nicely between the two standard sizes. Elevation does not change when switching from the notch to peep sight. Also works great on all AR15 Pistols.